Upper Grand Luxury ~ Open Concept Urban Living w/Private Stoop Entrance. This Home features 9.5' Ceilings, Gleaming Wood Floors, Enormous Chefs Kitchen w/42" Shaker Wood Cabinetry, Granite Peninsula that seats 4+. There are Two Generous Sized Bedrooms, Bathrooms & Walk-In Closets. The Master Bath has a Double Vanity, Linen Closet & Large Stall Shower, the Guest Bath offers a 60" Soaking Tub. Other highly desirable features include XL Capacity Washer/Dryer, GE Profile Stainless Steel Appliances, CAC and Garage Parking. This Premier 2005 Concrete & Steel Construction Building is Professionally Managed with a Financially Sound/Active Condo Association. There are Two Lobbies w/Package Concierge, Two Elevators, Residents Gym w/Peloton Bike and a Lush Landscaped Courtyard across the hall. The Neighborhood is fantastic and trendy and is now home to Hoboken's Largest Park, Traders Joes, an Abundance of Great Restaurants, Shops, Dog Park, Day Care, Schools, Playgrounds, Basketball, Tennis, Movie Theater ~ the list goes on. Commuting is a dream with easy access to the NYC Bus, Ferry, Green HOP to PATH & easy access to Highways. 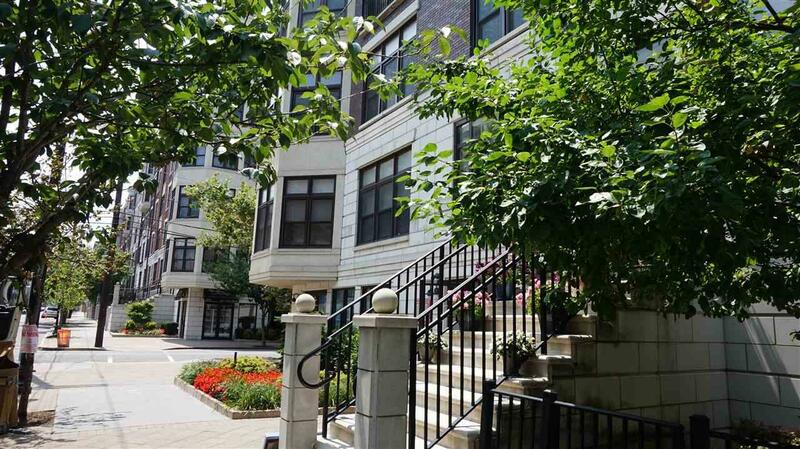 Make this your New Hoboken Dream Home!